The Marson ® 304-E / 39064 is a proven, professional tool that features a one-piece molded frame and front swivel air inlet for maximum operator comfort and durability. The Marson ® 302-E / 39062 comes complete with oil, replacement jaws, and nosepieces. 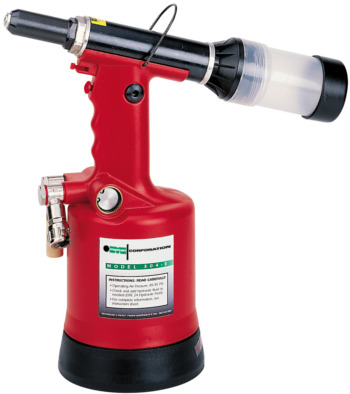 An external vacuum adjustment offers convenient air flow control for rivet placement and mandrel disposal. This allows the operator to install rivets in any orientation using one hand, and freeing up the other for assembly. Spent mandrels are conveniently collected in the bottle for disposal, encouraging a safer, clean work environment. Also included are 3/16" and 1/4" assemblies.